So my friend Bec dropped in the other day and brought with her a UK Good Housekeeping magazine with Nigella on the cover (Oct07). She doesn’t know I blog or that I was in the midst of my ode to Nigella. Cool, huh. 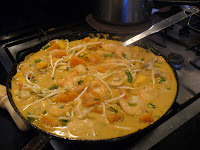 Many of you are aware of my absolute refusal to do the … Continue reading "Ode to Nigella 15 – prawn and mango red curry"